Dosbat: June Status Part 2a: Atmosphere - SLP fields. June Status Part 2a: Atmosphere - SLP fields. Rather than present these graphics in an animated gif (which can't be paused), or YouTube (which has poor resolution) I thought it best to put them all on one page. Here is a sequence of NCEP/NCAR sea level pressure (SLP) fields, the 2007 to 2012 average and the previous ten years including this year (2013). Source. I have already shown the development of a unique atmospheric pattern since 2007 (link), due to its dipole nature (link) it may have a role in sea ice loss (link), but may in turn be driven by sea ice loss. These issues will be discussed further in the next post, assuming I can get my ideas together by then. I'm having to delay the next post because although NCEP/NCAR daily data is now up for 30 June, the monthly/seasonal series and timeseries data won't be updated for a day or two. Using SLP over the high altitude dome of Greenland is not strictly kosher, but SLP fields are presented to illustrate action around Greenland as most people have less experience of looking at geopotential height plots. For context here is the average SLP for June in 2007 to 2012. Note the structure of the high pressure over Greenland and much of the Arctic, formed by anomalous geopotential height (GPH) ridging in that region, surrounded by a halo of low pressure which I presume to be induced by the anomalous Greenland GPH ridge. This structure is apparent to a greater or lesser degree in all years from 2007 to 2012. The interplay between low pressure along the Siberian coast, and High pressure over Northern Canada forms a dipole which drives air from Alaska to the Atlantic. In effect pulling warmer air over the Siberian pack ice of the Arctic Ocean. 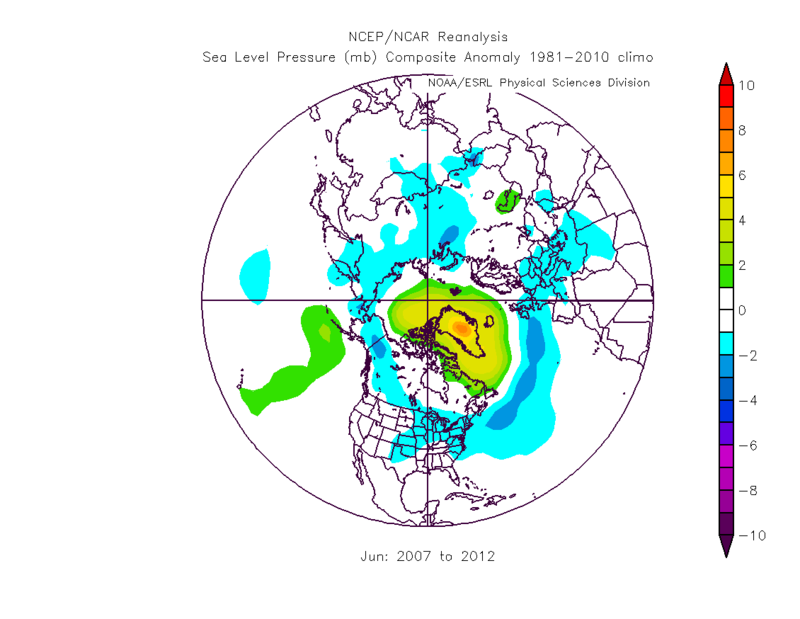 These three years were shown as typical examples of longer term variability in the Arctic region. With reference to the pattern revealed by average SLP for June in 2007 to 2012, the post 2007 years all show the pattern to a greater or lesser degree, apart from 2013, which appears to be the reverse of the post 2007 summer pattern, but is arguably more like a pre-2007 year, as shown by 2006 above. What does CT Area show? How Fragmented is the Pack? June Status Part 3: PIOMAS Volume. June Status Part 2b - Atmosphere and Ice. June Status Part 1: CT Area.